With his latest release, Mud Morganfield - They Call Me Mud released in March 2018 on the Severn Records label, Mud Morganfield, son of the late Blues master Muddy Waters, proves the apple did not fall far from the talent tree, as a singer, songwriter, and Blues musician, with 12 exceptional tracks that will make Blues fans want to pick up a copy a give it several listens. 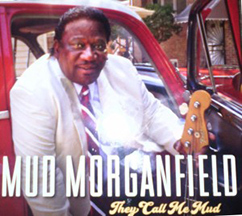 Mud Morganfield - They Call Me Mud was produced by Mud Morganfield and Rick Kreher and released on the Severn Records label. This is Mud Morganfield's third release on the Severn Records label. Larry "Mud" Morganfield was born in Chicago and is the eldest son of the legendary Blues Foundation Hall of Fame recipient, Rock and Roll Hall of Fame recipient, Blues Foundation Award recipient, and Grammy Lifetime Achievement Award recipient McKinley "Muddy Waters" Morganfield (1913-1983) and Mildred McGhee. An award-winning artist himself, Mud Morganfield lays down an exceptional 12-track Blues release with Mud Morganfield - They Call Me Mud, and proves his dexterity as a singer, songwriter, composer, and musician, writing 10 of the songs for the release, and pays homage to his late father with the tracks Howling Wolf and Can't Get No Grindin' penned by Muddy Waters. As a bit of a backstory, Mud Morganfield began by driving a truck and did not begin his career as a professional musician until his father's death in 1983, which may account for his rich story telling lyrics from his time being on the road. The release opens with the track They Call Me Mud, which has a killer long guitar and horn opening with Phil Perkins on trumpet and Michael Jackson on sax before sliding head first into Mud Morganfield's deep rich baritone and lyrics. Next on the playlist is the track 48 Days with Mud working his fingers on bass with Melvin "Pookie Stix" Carlisle on drums and Rick Kreher and Bill Flynn playing guitar. Mud slows the pace on the track Cheatin' Is Cheatin', then follows that up with Who's Fooling Who? which has a great percussion intro by Bryant "T" Parker and Mike Wheeler on guitar. Mud plays tribute to his father on the Muddy Waters song, Howling Wolf, which is out right spectacular with Sumito Ariyo Ariyoshi on piano. The catchy 24 Hours has great double-entendre lyrics, "...you know they call me the fireman, I put out ever fire I see..."
Anne Harris layers in a sweet violin interlude on the track Who Loves You to complement Mud's and Lashunda Williams' vocals. Oh Yeah is down and dirty Blues that just feels so right, then Mud covers another of his father's compositions, Can't Get No Grindin', with Rick Kreher, Billy Flynn, Studebaker John, Sumito Ariyo Ariyoshi, E.G. McDaniel,and Melvin "Pookie Stix" Carlisle providing backing vocals. By the time the track Rough Around The Edge came around, I was hoping that this release would never end, as the tracks just kept getting better and better. Mud's back on bass on the track, Walkin' Cane, with the double horns of Phil Perkins and Michael Jackson that make it a standout. The release aptly closes with the wonderful instrumental track entitled, Mud's Groove, bringing it slow and steady with Mud on bass, Billy Branch adding in harmonica and Bryant "T" Parker on percussion. © March 2018. Luxury Experience. www.LuxuryExperience.com. All rights reserved.